It is a gentle and effective therapy for mild to moderate musculoskeletal conditions and supports the body?s immune response without blocking the symptoms. This natural and scientifically proven anti-inflammatory and analgesic medicine is trusted by elite athletes and top sports physicians all over the world. 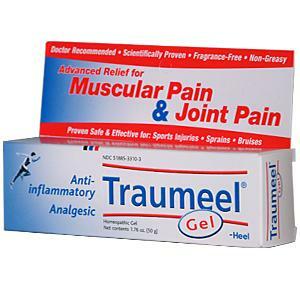 Traditional pain relief products only mask symptoms, Traumeel® skips the distractions of heating and cooling and instead provides a safe and effective solution. Calendula officinalis (Pot Marigold) aids in healing minor wounds, skin infections, burns, bee stings, sunburn, and warts. When combined with Symphitum it showed benefit in stomach inflammation according to a study of 170 patients. Hamamelis virginiana (Witch Hazel) is used to stop bleeding, and is believed to be effective on both internal and external injuries. This has been used to stop the bleeding on cuts, reduce bruising directly after an injury, and as part of the treatment for stomach ulcers. It is believed that the tannins present in witch hazel (especially the bark), along with various oils, help speed coagulation. Aconitum napellus used in topical creams and ointments to ease the pain and burning sensations that often accompany arthritis, rheumatism, and neuralgia. Belladonna also helps to relieve swelling & redness. Chamomilla best known as a muscle relaxant and antispasmodic.Chamomile is also believed to have antiseptic and anti-inflammatory capabilities. Echinacea & Echinacea purpurea best known for its immune enhancing ability. It has also been to aid in the healing of minor infections, herpes, candida, and wounds. When used externally it aids in skin regeneration while helping to heal skin infections, Psoriasis, eczema and inflammatory skin conditions. Millefolium helps to heal inflamed wounds, rashes, cuts, eczema, scars, and burns. It can also help to promote hair growth. Hepar sulphuris calcareum used to help heal injuries that are very sensitive to touch, are worse at night or in the cold, and with and pain described as shooting, violent, tingling, or cutting. Mercurius solubilis useful in relieving joint pain and external blistering. Symphytum officinale used for healing wounds and for treating the pain of arthritis. Hypericum perforatum helps to heal injuries to nerves, especially of fingers, toes and nails. Also helps to relief pain after operations. T-Relief is petroleum free this allows it to absorb & dry quickly. It is perfume and dye free so it leaves behind no stains or orders. DIRECTIONS: Apply to the affected parts and rub in, morning and evening, or if necessary, more often, possibly also applying an ointment dressing. Other Ingredients: Organic Aloe Oil (Organic Aloe vera Powder, Organic Soybean Oil, Vitamin E), Caprylic/Capric Triglycerides (from Cocos nucifera), Carrageenan (processed Eucheuma seaweed), Organic Coconut Oil, Ethanol (from Organic Cane), Organic Safflower Oil, Phenoxyethanol (Preservative), Purified Water, Natural Shea Butter, Sodium Polyacrylate (Emulsifier), Natural Sunflower Seed Wax. Each 2oz. (57 g) of ointment contains: Aconitum napellus 1X, arnica montana 1X, arnica montana 3X, arnica montana 10X, baptisia tinctoria 4X, belladonna 2, belils perennis 2X, calendula officinalis 1X, chamomilla 2X, echinacea 1X, hamamelis virginiana 2X, hypericum perforatum 6X , millefolium 2X, ruta graveolens 4X, symphytum officinale 4X.